As promised last month, Jon Bates wades through the music utilities and helpful hints. No April fooling here — it’s all good sound stuff. This is a surprisingly useful open-ended package from XRI. Used in conjunction with their Micon Midi Interface, it will receive and catalogue any midi information emanating from most midi instruments. If you have a midi-equipped keyboard like Cheetah’s MK5, you can record note-on/off and channel-changing information. However the MK5 is but a mute controlling keyboard. 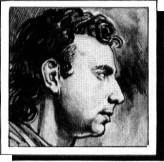 The Database comes into its own when used in conjunction with self-contained synths. Nearly all synths can send out on what’s called ‘systems exclusive’, with Casio synths being the slight exception to this — they need a literal poke up the backside before they decide to enter this mode. Systems exclusive is the part of midi protocol that has been reserved for the manufacturers’ own special needs relevant to their product. For example: a synth in systems exclusive mode will dump, via midi, all the parameters that go to make up a particular sound (‘patch’ in synth-speak). With the database you can arrange these sounds into a file, usually consisting of about 250 or more sounds. As most synths cannot hold this many sounds, it’s a very cost effective way of building a sound library without the expense of either a bespoke disk drive or a ROM cartridge. Okay, I know that many synths will perform a direct cassette dump of sounds. But to rearrange the order of these is very time-consuming, and to see them displayed all at once is not possible. Once you start controlling your midi gear from another piece of equipment you need to rack up these sounds in a corresponding order. Another valid reason for this piece of software is the lack of midi software for most synths. Apart from the popular synths like Yamaha, Roland and Casio, there’s a large amount of nothing available. So Korg, Akai, Kawai and company don’t get a look in. As I said before, whatever is churned out can be stored by the database. This can apply to drum machines, and even the portable keyboards that most schools seem to have. As long as the midi-equipped instrument can dump out information — usually on the exclusive part of its protocol — you’re in business. If you’re not sure, consult the ‘idiot guide’ that came with the machine. If you’re still confused, there are ways in which unwilling instruments can be coaxed into divulging their secrets — by inputting a data dump code... more of that later. 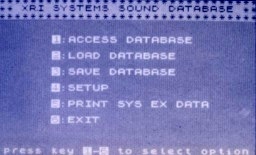 The program displays a main menu. The first thing is to enter the Set-Up page. This formats the database for your particular midi device. Try a few data dumps into the Spectrum and the set-up page starts telling you how many data bytes are in each dump. Alter a few goes the read-outs should be the same. 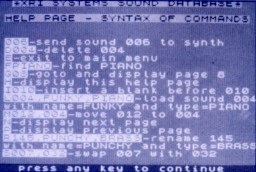 The program has adjusted to your instrument, set itself up accordingly to read the header codes and corresponding data bytes, and is now mapped out into a file awaiting the datadumps. At this point you save the entire exclusively formatted program to tape. This is then the new program for whatever synth/drum machine/trouser press you have. You can do this again for each different type of dump/instrument. Now the boring bit: the somewhat time consuming process of downloading each sound into its place in the file and giving it a name and category; for example 001 Trumpet — Brass, 002 Clarinet — Reed, 003 Storm — Effects, and so on. The database is preset into omni mode so it doesn’t matter about what channel the instrument is receiving or transmitting on. Again consult your handbook as some synths need a ‘systems info on’ command input to them — usually done from the synth console itself. 240 Enter Systems Exclusive mode: common to all makes. Unfortunately, manufacturers don’t make the exclusive information widely available, but you can at least see the codes and play around with them accordingly. You would need to input them in a string from any interface program that enters Midi codes — most interfaces will do this happily. When reading off the codes from manufacturers’ sheets be careful as they have a habit of changing from binary to decimal to hexadecimal without warning. As I said before, the midi interface on the single keyboards can often access individual voices, drums, as well as song data. The database has a wide application especially if you’re equipped with one of the less popular keyboards for which no software exists. School music departments could have a whale of a time with this as, at a very low cost, it’s a customised midi storage device — comparing more favourably with midi data files costing £300 plus. It is also microdrive compatible. The only gripe I have is that in keeping with most XRI products, the instruction sheet seems to have been written in haste and has not been proof read. In some cases it contradicts itself and is a trifle perverse: for instance, informing you how to send sounds to the synth first when you have an empty database staring at you. It takes until the third page of A4 before we get onto loading sounds from the synth. Great program — rewrite the instructions. I would be very interested to hear from readers who have come up with codes for systems exclusive. If there is a demand for some of the exclusive codes I may be able to help. The Midi Database System is available from XRI Systems. Software costs £22.95 and the interface £49.95.